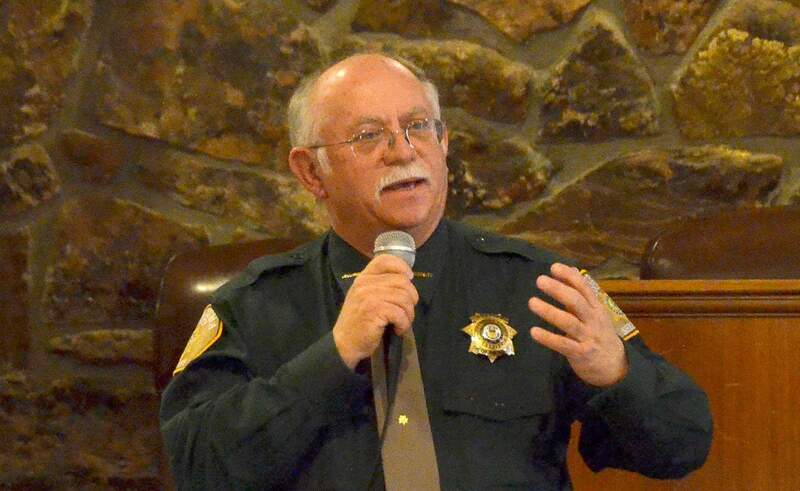 Montezuma County Sheriff Steve Nowlin on Friday said two deputies face disciplinary action after “inappropriate” behavior during a security check at elementary and secondary schools in Dolores. Sheriff Steve Nowlin responded to The Journal’s telephone calls on Friday evening, about three hours after Phil Kasper, superintendent of Dolores School District Re-4A, emailed a letter to parents and staff to update them about the incident, which occurred on Aug. 17. Parents emailed copies of the letter to The Journal about 6 p.m. Friday. According to Kasper and Nowlin, Deputy Donnie Brown was conducting a security walk-through with the school resource officer when the incidents occurred. Nowlin identified the school resource officer as deputy Kaylee Green, adding that she also faces disciplinary action. “I take full responsibility for their actions,” Nowlin said. In other classrooms, Green and Brown “interrupted the teaching and learning to lecture teachers about locking their classroom doors,” Kasper’s letter said. “The Deputy had a mouthful of tobacco while in the school setting,” Kasper wrote, referring to the schools’ status as tobacco-free. “If I need to meet with parents, I’ll do it,” Nowlin said. Elementary Principal Gary Livick told The Journal on Friday that school policy is that all outside doors to the school must be locked and are checked daily. The policy for the interior classroom doors is that they can be left open at a teacher’s discretion, but the door handle or knob must be in the locked position. “That way, when the door is pulled closed in an emergency, it is quickly locked,” he said. All teachers have keys to lock their classroom doors. During the safety check Aug. 17 by the sheriff deputies, Livick said, all the elementary’s exterior doors were locked, but three classroom door handles were not in the locked position. Teachers, some of whom are new, have been reminded of the policy, and follow-up checks show they are complying, he said. Incident starts flurry of emailsThe incident quickly started a round of emails between school administrators and the Sheriff’s Office beginning Aug. 17. Livick emailed Nowlin on Aug. 17 to report that a teacher said that 10 minutes before the end of the school day, Brown and Green entered an unlocked door and said in front of the class, “We need to shoot your teacher.”Secondary School Principal Jenifer Hufman emailed Nowlin on Aug. 18 to report that a teacher said Brown pointed a “finger gun” at her and said, “You’re dead.”On Aug. 18, Brown apologized in an email to Nowlin “for any issues that I might have caused. ... My only goal in doing the security checks was to assist with safety and security of our children and staff at the schools.”In a memo dated Aug. 20, Green said she and Brown “located 7 exterior doors unlocked or propped open with rocks, as well as several interior doors unlocked.” She reported that although she didn’t hear what Brown said in the high school class, after the visit to the elementary class, he said something like, “I guess I just shot the teacher.” Green added in her Sheriff’s Office memo that she apologized to principals and teachers.Kasper wrote in his letter to staff and parents that he and Nowlin discussed the incident early on Aug. 20 and again on Aug. 21. Nowlin met with Kasper, principals and staff, the superintendent said.Nowlin emailed an apology to Dolores school board members and school administrators on Friday afternoon. In that email, which he provided to The Journal, Nowlin apologized for Brown and Green’s “inappropriate” behavior and stated that he “was truly embarrassed.” He said the safety check and contact with students and teachers were conducted without his knowledge or approval.Brown has not faced disciplinary action before the classroom incidents, Nowlin said. Brown, who also serves on the Sheriff Office’s mounted patrol, recently was involved in an investigation after his horse kicked and injured two children during the Escalante Days festival in Dolores on Aug. 11. One child was taken to a Denver-area hospital for observation. Two deputies from the Sheriff’s Office serve as school resource officers – one in Dolores, another in Pleasant View and Lewis-Arriola elementaries. Two deputies – Brown and Tish Strawn – are on contract as law enforcement officers for the town of Dolores. Strawn currently is on leave, Nowlin said. A time of heightened awarenessThe classroom incidents come in a year of heightened awareness in Montezuma and Dolores county schools after the shooting at Aztec High School in New Mexico on Dec. 7. The shooter, former student William Atchison, 21, killed two students before killing himself. Schools in Montezuma County subsequently held vigils in honor of the Aztec students, and school boards in Cortez, Mancos and Dolores discussed safety policy. In April, a suspect was arrested after an unsubstantiated threat was made toward Montezuma-Cortez School District RE-1, which announced that the high school went into lockout status. The suspect who allegedly made the threat was apprehended in Cortez after the Montezuma County Sheriff’s Office located his car behind the old courthouse, according to the Cortez Police Department.“He was inside the old courthouse seeking food stamps,” Patrol Lt. Andy Brock said. In February, Montezuma County schools went into lockout status in response to two potential threats.Mancos School District Re-6 Superintendent Brian Hanson said an anonymous phone call led to a lockdown in Mancos. A former substitute employee later pleaded guilty to making a threat against students and staff. An investigation by the Mancos Marshall’s Office showed that the employee was the one who called the office from her cell phone just before she reported the threat. Cortez Lt. Brock later confirmed that a separate rumor, reported anonymously through Safe2Tell, led to a heightened law enforcement presence at Cortez and Dolores schools. The Dolores School District said it did not receive a threat. Safe2Tell Colorado is an anonymous emergency alert system designed to help Colorado citizens report threats to their communities. Trent Stephens and Jim Mimiaga, of The Journal, contributed to this article.